Without any clue as to the woman's whereabouts or movements, with no reported sighting, no suicide note and no body, she knew perfectly well she could not justify spending any more time on the case ... she had probably spent too much time on it already. Angela Randall had disappeared, and until she turned up again in some form, she was merely the number she had had assigned to her ... Missing person BH140076/CT. But then the disappearances continue. This is another book that feels like a game of Town* -- and you know how I love that. Some of the cast: DS Freya Graffham, who left London and an extremely unhappy marriage for Lafferton, a small (but not too small) cathedral town. DCI Simon Serrallier, a private man who is semi-estranged from his father, who has a second career that he keeps completely separate from his police work, who breaks hearts right and left but is either too oblivious to notice or too much of a cad to care. DC Nathan Coates, with the face of a criminal and a heart of gold. Debbie Parker, a depressed young woman who develops an interest in alternative medicine. Cat Deerbon, local doctor, sister of DCI Serrallier, who, while accepting of some forms of it, is concerned about the harm that alternative medicine can do. 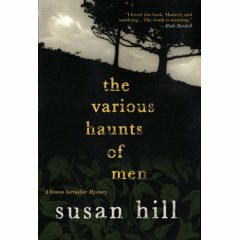 In The Various Haunts of Men, we hear from everyone, including the person who is behind the disappearances, and we get everyone's opinion of everyone else. As much as I tend to like books with this format, it took me a little while to get hooked -- bouncing around makes it harder to form attachments to the characters. Once I was hooked, I started thinking about suspects. (Honestly, at one point or another, I suspected almost every character.) About halfway through, though, I sat for a moment and just thought it out -- and I pegged it. What's odd, though, is that it didn't detract from the suspense at all -- if anything, it heightened it. And then, when it was totally and completely clear that I was right... well, it got even more suspenseful. It's a solid police-procedural-soap-opera-family-story-crime-drama. I'm very much planning on reading the next book in the series. *From Harriet the Spy: "Harriet was trying to explain to Sport how to play Town. "See, first you make up the name of the town. Then you write down the names of all the people who live in it. You can't have too many or it gets too hard. I usually have twenty-five."" Man, I have got to start reading McCarthy. I apologize in advance for the first video.